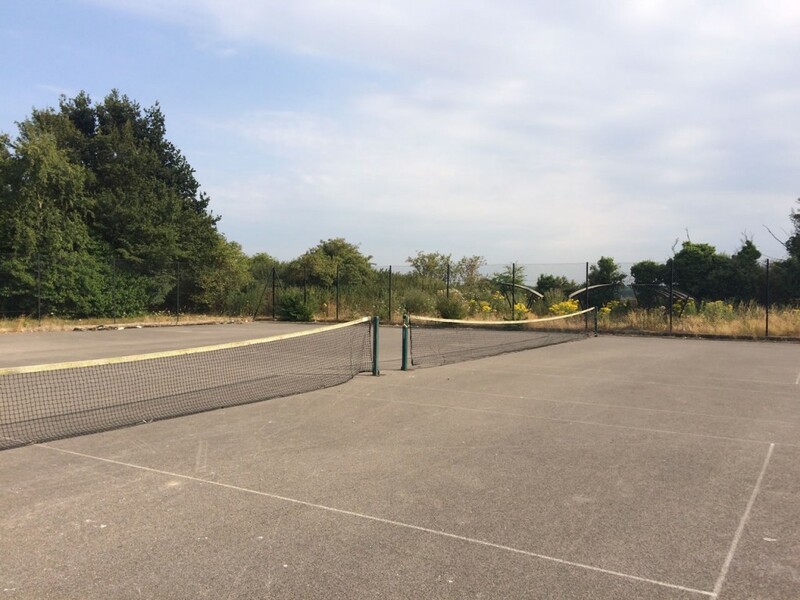 The outdoor tennis courts close to the Apollo youth club building on the Campus are ready for free use from the start of August. Youth club members will be able to use the courts on club evenings, and a number of racquets and tennis balls will be made available. At other times the courts will be unlocked and available for free use according to demand. The main gate to the site is from Harrisons Lane, and this is unlocked at certain times. However there is pedestrian access via the gate on Bungay Road and the footpath. Please contact us through info@halesworthcampus.org if you are interested in using the courts, and watch for further notices of opening times. We are keen for people to have fun playing tennis, and get in lots of practice. Campus trustees ask simply that you respect the facilities and other court users. Please take any litter home with you, or use the litter bins outside the Apollo building. As usual the Campus will be hosting tag rugby for all ages on the grass pitches on Monday evenings. On 4 July, the first meeting of the Campus Arts Advisory Group was held. This is made up of people involved in the arts locally, and representatives from several arts-related organisations. Drawing on their expertise, knowledge and imagination, the Campus aims to ensure that the new facilities are designed in the best possible way to create a pleasing and stimulating environment. This includes the quality of materials used in construction, and the creation of walkways, seating, planting and siting of art works across the Heathy Neighbourhood area. 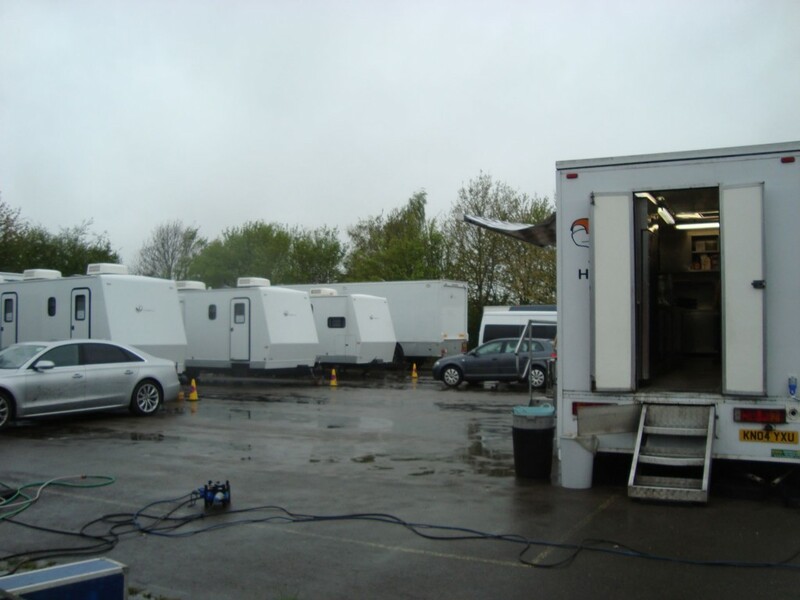 We were pleased to be able to provide hard-standing on the Campus for the caravans and support vehicles of the Richard Curtis / Danny Boyle film unit for a few nights at the start of May 2018. As the photo shows, it was a rainy week, so the Skills Centre, the car park, and the old tennis courts proved very useful, alongside the use the crew made of the town car park. Our thanks to the Apollo youth club which suspended its meetings that week in order to make way for them. 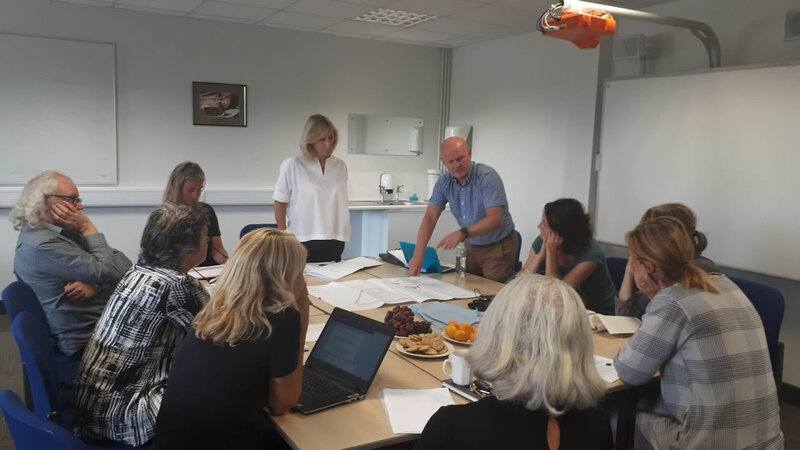 This month Campus trustees passed important stages in signing the legal agreements and documentation concerning the sale of part of the site to Castlemeadow Care. The money from this sale will be devoted to the development of the new sports facilities. We are really looking forward now to submitting detailed plans to Waveney District Council as the next step in seeking planning permission for the whole development. Halesworth Campus was represented at the Living Well event organised by Halesworth Volunteer Centre and the Waveney Community team, where all kinds of organisations were able to network and learn more about one another. 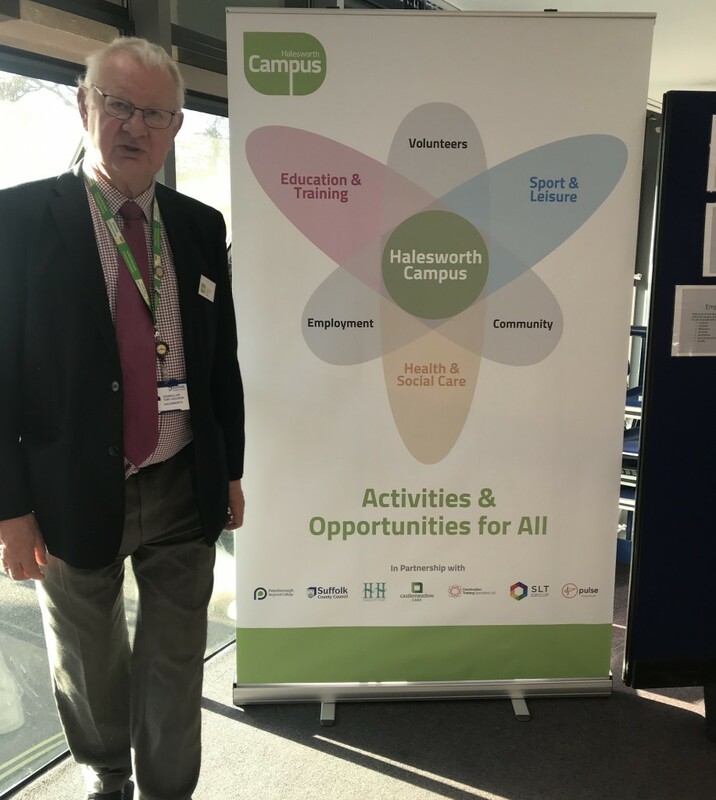 We also made a live presentation to Halesworth town councillors and provided them with up-to-date details of the Campus project. We meet regularly with some town councillors and the Apollo Youth Club leader, and talk to other youth-focused organisations, because we are concerned to play a full part in creating and improving opportunities for young people – including in sports, in training and in volunteering. Congratulations to Southwold Rugby, who train on the Campus, and whose first XV have gained promotion to London 2 North East – their highest level yet. The trustees of Halesworth Campus were sad to lose our dear friend and colleague Erik Wilcock who died on 6th March 2018. The funeral and celebration of his life was packed with family members, friends, colleagues and former pupils who came to honour how much Erik meant to them. Erik’s voluntary commitment to the Halesworth Campus project was outstanding. 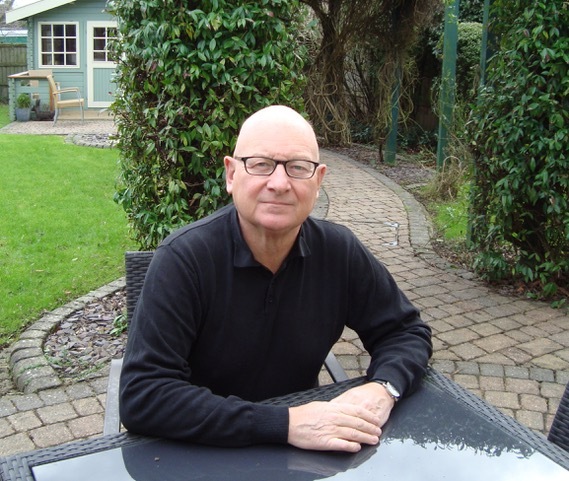 As one of its founders, and as a very active trustee over the last six years, he was passionate about creating opportunities for local people to play sports, and for young people to learn and develop new skills. We will miss him terribly, and regret deeply that he did not live to see the completion of the project he cared so much about. But we do believe that thousands of people in the years to come will benefit from the vision Erik worked tirelessly to achieve. The Campus Development Board approved an Arts Policy to include promotion of the role of the arts in forward planning. 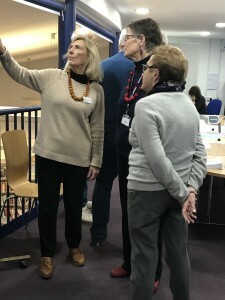 In the Skills Centre, evening classes in “Computing for the timid”, Digital photography, and Sugarcraft/cake decoration, began with good attendance. Big January storms damaged the fencing around part of the Campus site. Thankfully, the Apollo youth club organisers took quick remedial action to help ensure safe access to their building. In February work squads from the Community Payback scheme removed the fencing and did substantial clean-up work on site. The Property Group co-ordinates all property matters – including sales, leases, planning & design, the build phases. Campus Trustees met with Apollo youth club leaders and agreed a new lease for the youth club premises. Town councillors accepted that they had issued wrong information about the Apollo youth club lease, and they published an apology and correction on the Town Council website. Halesworth Campus stated that it has been supportive of the youth club and its activities for several years, and will go on being so.